I started the new year with a new project – Diamond Braid by Trish Stuart. 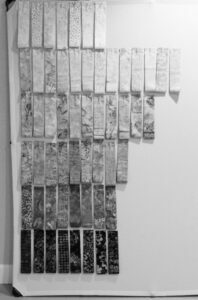 This will be a twin-sized quilt when it is completed and, as you can see, it already is longer than my design wall. There are only five more blocks, then the center will be completed. It took almost as long to separate the fabric into six different groups – very light, light, light medium, medium, dark medium, and dark – as it did to sew. 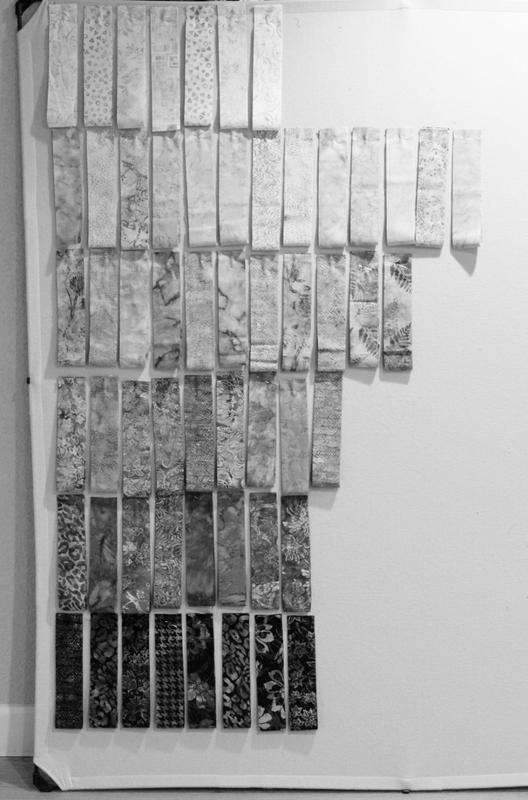 A black and white photo of the fabric strips helped me decide on placement. 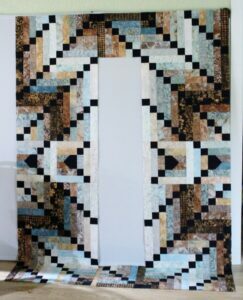 It is such a beautiful quilt, however I was disappointed to discover mistakes in the directions. One example is that it says to piece 4 dark chain blocks when 6 are needed to complete the top. It was a good thing that I had some extra fabric strips to make the additional blocks. Another error is that the cutting guide lists 2 1/2″ x 10 1/2″ as the longest strip needed, but there are 8 blocks that need a strip 12 1/2″ long. This would be a great beginner quilt if the instructions were more accurate. I am making a different center block than the original quilt, but I had planned to do that from the beginning. Hopefully I will have the top done in the middle of the week. That is going to be a stunner! Can’t wait to see what you will do in the center. Thankfully you are experienced enough to recognize a mistake when you see it. It is annoying when the instructions are not correct. You are making a gorgeous quilt. Looking forward to seeing your finish. Thank you. I am very pleased with finished quilt top.